The Australian theme park Sea World, which includes a marine mammal park and oceanarium, is located on the Gold Coast in Queensland and is quite unrelated to the U.S. theme park chain SeaWorld. Since it’s opening in October 1971, the theme park, which is open all year, has undergone quite a few changes and developments to become the beloved attraction that it is today. Is there a better way to learn about animals than meeting them? Celebrate the polar bears at Sea World and meet Liya, her son Henry and twins Hudson and Nelson. At Seal Harbour you can get envious of the sea lions lazing in the sun or splashing about. Meet King penguins and Gentoo penguins at the Penguin encounter. The smallest penguins in the world have their own enclosure at Penguin Point, so make sure not to miss the cute Fairy penguins. There is nothing daring about meeting the stingrays, which can be visited at Ray Reef. They will come close enough for you to touch. If you go and see the sharks, you will find them behind a thick glass in their aquarium. 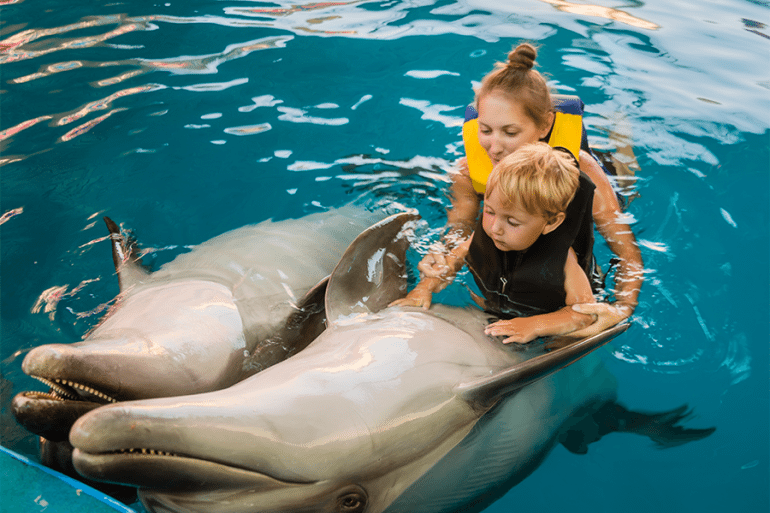 Dolphin Beach is beloved by everyone, which features two large sandy lagoons and a show pool. Here, Offshore Bottlenose dolphins can be visited and often you will be able to see baby dolphins. Try out the Storm Coaster roller coaster or visit the Castaway Bay, which is an interactive adventure playground. The Sky Fortress and the Sky Climb are for those members of the family who love to climb. Not for the faint of heart is the Jet Rescue, another amazing coaster with speeds of up to 70 km/hr. Afterwards, prepare to get wet on the Viking Revenge Flume, a 460m floating ride. Beach Break Bay offers fun rides for kids of all ages. Here you will find the Splash Capsule, the Beach Ball Bounce and the Beach Dump Trucks as well as the Beachbreak Bay Carousel. When it’s time for adventure, you should check out the Air Sea Explorer or dare to reach new heights on the Sea Climb. Take a break and tour the park on the Sea World Monorail, which will take you around exhibits, rides and shows. Another way to take everything in from high above is the Sky High Skyway. For everyone who wants to cool down, a trip to the Sea World Water Resort Park will be just the ticket with its slides, pools and water fountains. Bear in mind that the park is closed between late April and early September. The Affinity Dolphin Show is the show everyone wants to see. It’s not only hugely entertaining, but teaches visitors about ocean life as well. At the Nickelodeon Character Meet & Greet, children get to meet their favourite Nickelodeon characters, among them SpongeBob and Patrick Star or the Teenage Mutant Ninja Turtles. Meet comedic sea lions in the Fish Detectives show, which will have the whole family roaring with laughter. If action is more your thing, you will enjoy the Jet Stunt Extreme show, which features the world’s best jetski stunt performers. Dora’s Adventure is a delightful musical adventure that offers fun for the younger family members. And make sure not to miss SpongeBob 3D, here you will visit an underwater world where anything can happen. The General Admission is the one to go with, if you‘re only there for one day. Children aged 3 to 13 get discounted tickets. You can get three parks for the price of one with the VIP Magic Pass that gets you into Warner Bros. Movie World, Sea World and Wet’n’Wild. If you live near enough to go more than once a year, the Annual Pass is definitely the best bargain. Also consider buying an Animal Adventures ticket, which allows you to join Sea World’s trainers. And, of course, the Sea World Helicopter rides are very special treats indeed.